HOW LONG will the public be willing to suffer finger-pointing and excuses before it demands real solutions to real problems, such as deteriorating roads that ravage our vehicles and the sad state of affairs that led to the city's dumping of 48 million gallons of raw sewage into the center of Waikiki, the engine of our state's economy? We are at a crossroads now, one at which the city must recognize its charter obligations to provide infrastructure and public safety. Unfortunately, it is doing neither in Nuuanu. 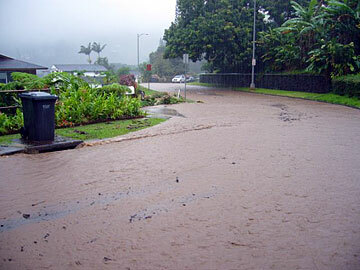 Flood waters transformed Kahawalu Drive in Nuuanu Valley into a river during the recent stormy weather. 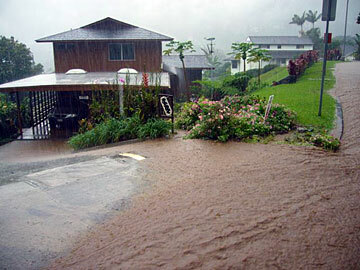 Nuuanu residents fear a proposed development on the hillside above the neighborhood will increase the threat from storm runoff. 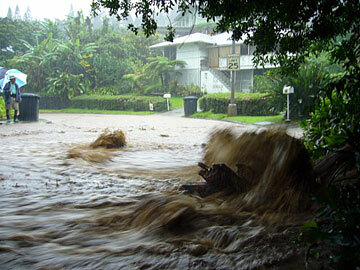 The streets and drainage in Nuuanu are in shambles. Despite promises dating back to the 1970s, the city has done nothing to improve this infrastructure. And rather than allow residents to participate in the process by which an aggressive developer, Laumaka LLC, proposes to disrupt, deface and develop the steep mountainside above Nuuanu Valley, the city is steadily moving through the permitting process and toward accepting questionable reports and approving the project in a knee-jerk, same-old, accommodate-the- developer-at-any-cost fashion. It gets worse. When residents' efforts -- including letters and petitions signed by some 1,100 people, 200 yard signs, and a dramatic meeting with the neighborhood board attended by more than 300 people and resulting in a spate of constructive recommendations -- failed to move the city, the administration provocatively suggested that the residents file a lawsuit if they wanted to get the information and access the city had denied to them. Then, when the Nuuanu Community Association filed just such a suit, the Corporation Counsel, in a truly strange opinion, advised City Council members that they could not consider any legislation supported by the residents, whether or not that legislation had merit or benefited the members of this community. The Council members then circled the wagons, further isolating themselves from their own constituents. It was on the Corporation Counsel's advice that Councilwoman Barbara Marshall, chairwoman of the Zoning Committee, "deferred" (read "killed") Bill 37, which sought to suspend development of unsuitably steep mountainside parcels because of the grave risks involved. Indeed, Dara Onishi was killed Aug. 9, 2002, by a boulder that fell into her Nuuanu bedroom and crushed her, a tragedy that was followed by a number of near misses from the same mountainside. By summarily killing Bill 37, the committee had, on counsel's advice, deprived the dozens of people waiting to express support for the bill their constitutional right to petition their elected representatives. I suggest that the Corporation Counsel should not be telling the members of the City Council to kill any bill believed to come from the residents of Nuuanu Valley. That reeks of retaliation for bringing the suit that the city encouraged Valley residents to bring. It is not inconsequential that two weeks after the killing of Bill 37, Senate Concurrent Resolution 98 was passed out of the Water, Land and Agriculture Committee in the state Senate after vigorous support from the community and Peter Young, director of the state Department of Land and Natural Resources. This resolution warns the city to be "cautious" before allowing mountainside developments. Yes, the state is cautioning the city. We have had loss of life because of these hazards, and it seems so irresponsible for the Council to kill a bill that is so timely and appropriate given the loss of life we have had even in the past few weeks from the same kinds of hazards that Nuuanu residents are concerned about. The bottom line is that the infrastructure of Nuuanu Valley continues to deteriorate, effectively abandoned by the city, as so many other neighborhoods, notwithstanding the huge tax revenues the city is getting from high property taxes; the city is ignoring the requests of Nuuanu residents for information and involvement in processes that directly affect them and put them demonstrably at risk of life and limb. And on top of all that, the city has adopted a policy that affirmatively punishes those who would complain about such treatment by denying consideration of any bill they would support. Functional or dysfunctional? You decide. There must be a wake-up call when the members of the City Council -- with the exception of Rod Tam, who has been quite helpful -- and the city administration are at such great odds with, and so unresponsive to, the community they have sworn to serve. More than that, this series of events is an intolerable and continuing outrage to the residents involved. Perhaps these public officials feel they are immune to the wishes and welfare of the community. Not so. Let's remember them well, and what they have done and failed to do at this critical and undeniably tragic intersection, and let's throw them out of office at first opportunity. Jay Fidell is a Honolulu attorney and member of the Nuuanu Valley Association.